Well, the mercury is finally dropping here in Australia, which means that most Aussies will now start retreating back into their homes to hibernate for the colder months. It means that we start going out less, and ordering-in more. This is nothing to be ashamed of because our wines taste just as great when they’re paired with fine dining cuisine as they are with your favourite takeaway foods! The rich, spicy aromatics of Thai food can cure just about any cold-weather grumpiness; and those same, vibrant spices, require an equally rich and complex white wine. While many white wines taste good with Thai food, we assure you that one wine pairs better than any, and that’s a cool climate Riesling . Italian food and red wine there can be no question that these two were meant to be together. In fact, in Australia, the term "Pizza Red" often refers to a quaffable and affordable bottle of red wine, as it's usually going to be enjoyed within an hour of leaving the bottle shop, and usually with a takeaway pizza. While just about any red wine goes well with a pizza, there can be no denying that the rich, scrumptious flavours of the Italianate Sangiovese <LINK TO IT'S PRONOUNCED MUDGEE SANGIOVESE> are the perfect ticket to cut through the cheesy textures and herbal flavours of any pizza. When it comes to the full flavoured, creamy curries of India, you may be tempted to reach for a Sauvignon Blanc to cool that chilli burn. However, you'll find that those delicious, creamy flavours and that velvety mouth-feel are a much better pairing for a chilled Chardonnay (especially one with a little oak). With so many options on the menu at your local Chinese restaurant, it can be hard to pick one wine to go with every flavour. In this instance, we advise keeping two styles of wine are on hand. A crisp, dry white, such as Sauvignon Blanc, will pair brilliantly with bold, saucy dishes, whereas it's worth keeping a slightly chilled Pinot Noir close at hand if you're ordering anything from the duck section of the menu. 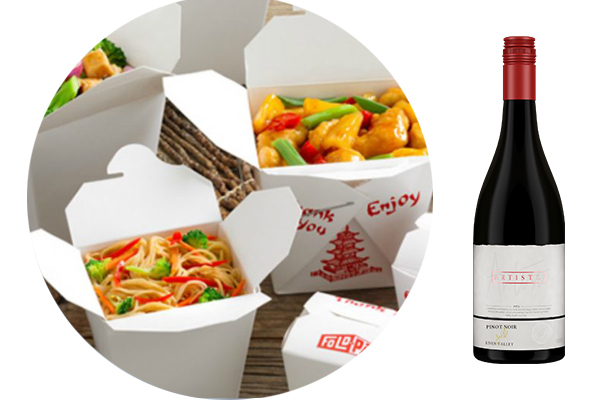 Whichever food and wine combination is your favourite, the best thing about takeaway is not having to leave the house. So don’t get caught out, make sure you’re well-stocked with fantastic, Australian wine to ensure you get to better enjoy your favourite takeaway. © The Collective Wine Company. All Rights Reserved.